RenovationMates can offer you variety of roofing services in London including roof installation, roof repair, waterproofing and re-roofing. The roof protects the whole building from the weather hardships which every season brings. Every residence must have a solid roof that will keep the rain, snow, wind, heat and moisture away from your home. A single mistake in a roof installation may lead to serious problems. Therefore, when it comes to roofing services, you shouldn’t make any compromises. We are a London based company which performs professionals roofing services in London. We offer you qualitative assistance that will solve all of your problems. You are at a phone call away from getting a the best roofing service you could find. Our company has been in the roofing business for a lot of time. Along the years of our practice we have collected solid professionals experience. We have a full package of services which will grant you an excellent roof that will last in time. Our roofing is performed by a team of well trained professionals, who have the skills to overcome every challenge. We know that time and quality are crucial for every roofing job, so we have optimised our services to complete our tasks even in a short periods of time. Inside our team we have qualified constructors, architects and property managers. With their skills and knowledge, we have the confidence to offer you roofing services that will satisfy the individual needs of every client by the provision of the most appropriate solutions. These are only the general services which we can offer you. If you need other assistance for your roof, feel free to call us because there is a great change that we will have everything needed to solve your problem. All sorts of roofing issues or materials can be handled by our qualified workers. If your residential or commercial roofing has minor or severe damage, we can offer you the excellent teamwork of our repair technicians. They have the skills, equipment and materials to restore the looks and functionality of your roof. Do you need some kind of help for your roof? 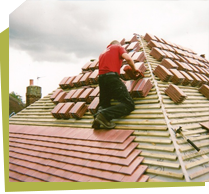 From construction and layout to repair and replacement – we offer the most professional roofing services in London. All you have to do, in order to receive our assistance, is to pick up the phone and dial our phone number.